Dr. Stan Norman has been officially installed as the seventh president of Williams Baptist University. The inauguration ceremony was held Friday morning, Sept. 28, before a packed house in WBU’s Manley Chapel. The crowd included state and denominational dignitaries, as well as representatives from a number of other colleges and universities. 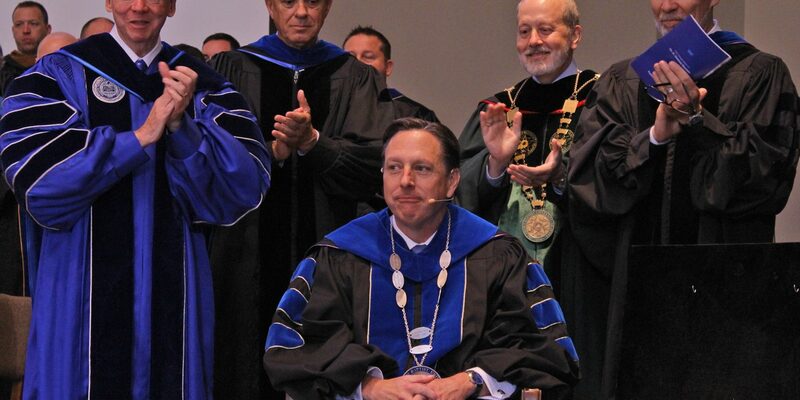 J.R. Cox of Walnut Ridge, chair of WBU’s Board of Trustees, performed the investiture and then placed the school’s presidential medallion on Norman. “We entrust to you the task of leading this institution, under God’s divine providence, to be of ever greater service to its students, to the world, and ultimately to Christ’s Kingdom. As you assume these responsibilities, we pray that God’s blessings will be upon you; that He will grant you wisdom, strength, and courage, and that He will anoint you with vision and leadership as you faithfully and obediently walk with Him,” Cox said. The main speaker for the ceremony was Dr. David Dockery, president of Trinity International University and former president of Union University. Dockery has been a longtime mentor to Norman and nominated him for the presidency at Williams. Presenting his response, Norman outlined his vision for Williams. “What we do here at WBU makes a difference; what we do here matters. 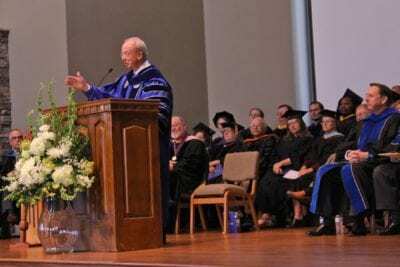 Grounded upon the historical vision and founding purpose of this school, I want to cast anew a vision for Christian higher education that renews minds, transforms lives, and changes the world,” he said. Dr. Bob Magee leads the Inauguration Choir. Greetings were presented at the inauguration by Arkansas Lt. Gov. Tim Griffin, District 60 State Rep. Fran Cavenaugh, Walnut Ridge Mayor Charles Snapp, Arkansas Baptist State Convention Executive Director Dr. Sonny Tucker, and several others. Also having a role in the ceremony were Dr. Gene Fant, president of North Greenville University in South Carolina, Dr. David Whitlock, president of Oklahoma Baptist University, and Dr. Kenneth Startup, professor emeritus at WBU, who served as academic dean and interim president at the university. 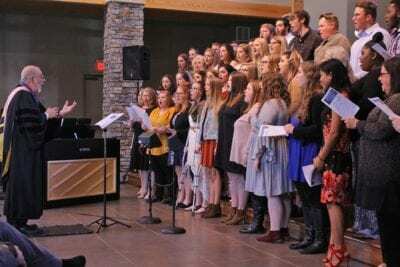 The ceremony also featured performances by the WBU Band and an Inauguration Choir, which was composed of current members of the Williams Singers and a number of WBU alumni. WBU is a private, Christian university in Walnut Ridge. It is owned and operated by the Arkansas Baptist State Convention.